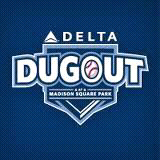 Delta Airlines is hosting a baseball haven at Madison Square Park this weekend. Who cares if you couldn't snag some coveted subway series tickets. Meet up with your favorite baseball lovers, grab some shake shack yummies, and settle in for a great night. Gaming Village and Delta Sky360 Lounge includes: Batting Cages, Fast Pitch, Custom Photo Booth, Delta Destination Challenge, Plane-Ko, Silent Auction, Kids Corner, Dugout Trivia, Specialty Concessions, Giveaways. 11am-6pm: Gaming Village and Delta Sky360 Lounge: Batting Cages, Fast Pitch, Custom Photo Booth, Delta Destination Challenge, Plane-Ko, Silent Auction, Kids Corner, Dugout Trivia, Specialty Concessions, Giveaways. 3pm: Mr. Met Meet & Greet. 7pm: Live Viewing of Yankees-Mets series, game two, with great giveaways, including travel packages from Delta, baseball gear and tickets to future Mets and Yankees games**. One Responses to "Subway Series Fun in Madison Sq Park"